SANTAROMA COMPLEX BOURGEON 30ml menopause in our pharmacy bio, Comment on advice for use and dosage with our partner Avis checked after your purchase. Menopause is a normal physiological stage in women characterized by a decrease in estrogen and progesterone production due to the gradual cessation of ovarian function, loss of reproductive function and stopping of the menses. 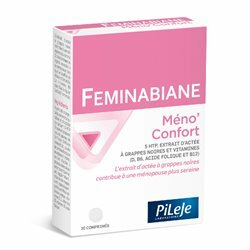 What are the beneficial buds for menopause present in this Santarome complex? Young raspberry sprouts : a regulator and stimulant of ovarian function, raspberry balances the secretion of estrogen and progesterone. Young shoots of Cranberry : they have an estrogen-like action that compensates for the loss of estrogen that causes hot flashes. Downy birch buds : they help to fight against the general fatigue often frequent in menopause. It is also an excellent natural liver purifier . The birch bud is used by people with water retention as is often the case for menopausal women. Take 25 drops daily, pure or diluted in a glass of water (200 ml). 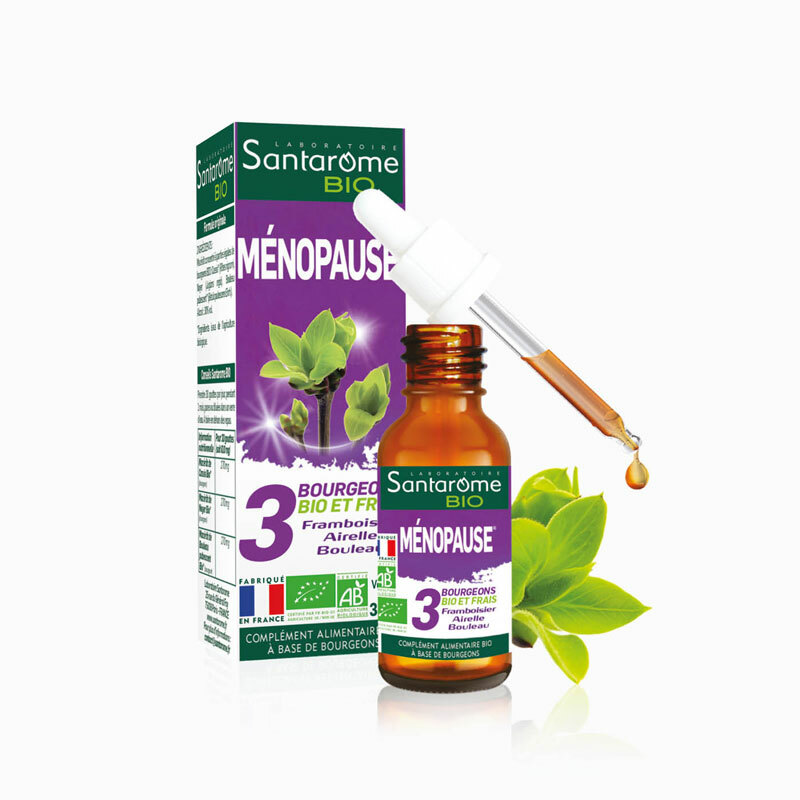 Comment on the recommendations for use and dosage of SANTAROME COMPLEXE BOURGEON menopause 30ml with our partner Avis checked after your purchase. Glycerine macerates with equal parts of: young shoots of Organic Raspberry * (Rubus idaeus L.) (225 mg), young shoots of Airelle Bio * (Vaccinium vitis-idaea L.) (225 mg), birch buds Bio * (Betula pubescens Ehrh.) (225 mg). Alcohol: 30% vol. (1) Raspberry helps to better support the period of menopause. * Ingredients from organic farming - FR-BIO-01 - EU / NON EU agriculture. A dietary supplement should not replace a varied and balanced diet or a healthy lifestyle. Do not exceed the recommended daily dose. Keep out of reach of young children. Not recommended for pregnant or breastfeeding women. Not recommended for people with allergy to salicylate derivatives and people on anticoagulant therapy. Excess use may result in laxative effects. The presence of a slight deposit due to the use of organic plants does not affect the quality of the product. The Santarome Menopause Bud Complex is in the form of a 30 ml dropper bottle. What are the main symptoms of menopause ? Menopause is one of the major turning points in the life of a woman. Menopause is often synonymous with drawbacks: hot flashes, headaches, night sweats ... etc. How to best prepare and live daily menopause? To help you get through menopause and pre-menopause with the greatest physical and emotional well-being, our expert pharmacists have selected dietary supplements characterized by a very high naturalness, attested by organic certification in most cases, as well as only by excellent dosages. The compositions vary according to the targeted benefits of each of the formulas, you will find herbal compositions such as sage, cimicifuga, yam or Chinese angelica, others based on borage and evening primrose, rich in omega-3 or complex rich in minerals. Discover the new range of food supplements of your pharmacy bio care and nature to effectively treat your menopausal problems.